I was reminded by the writings of King Solomon of an idea I had a few years ago but neglected to write down. In Ecclesiastes he draws a picture of the never-ending cycles of life which could be seen as having a beautiful balance and harmony but perhaps more commonly as acting like a monotonous cage. The sun rises and the sun sets, and hurries back to where it rises. The wind blows to the south and turns to the north; round and round it goes, ever returning on its course. All streams flow into the sea, yet the sea is never full. To the place the streams come from, there they return again. All things are wearisome, more than one can say. The eye never has enough of seeing, nor the ear its fill of hearing. What has been will be again, what has been done will be done again; there is nothing new under the sun. Certainly my recent experience online has felt like being trapped in a loop. I have been on/in Twitter for about five years now and most of what I see sailing past about education and/or technology appears to me to be a rehash of ideas I heard in previous years. Similarly in the land of shiny-tech there seems to have been very little of interest. It’s all higher rez, faster and thinner but in essence it’s not moving on. Witness the bored response to the latest iPhone. It’s as if we greedily consumed technology, are now feeling queasy and couldn’t possibly consume another Smartphone. We talk of elegant consumption but it feels bloated to me. Where has the dynamic, frontier-like web gone? Am I suddenly too old to ‘see’ the leading edge or is a large part of what happens online just the passive reception of main-stream media? I worked on digital projects for the BBC at the turn of the century. Back then us young-guns felt as if we were on the verge of something genuinely new – outside of the loop (we were enthusiastic and a little naive). Looking back now it appears that the moment the iPlayer started to work smoothly the BBC stepped away from Social Media engagement and many there heaved a huge sigh of relief when they realised that ‘online’ could be used to distribute TV and Radio. Despite the promise of the web are we trapped in our classic producer-consumer cycle? Perhaps advertising a hash-tag at the start of a programme is all that is needed, maybe that’s what taking-part was always going to mean? The truth is that there are very few people out there with something to say and the skills to express it, those that do are quickly assimilated into a broadcast mindset. Beyond 150 people it’s all celebrity and performance? This is all surface though and the reality, as ever, is far more complex than my rant. There are fascinating and disruptive things happing out there in the unpredictable currents of the tide fight where society and tech wrestle. Our immediate perspective is often of a Solomon’s recursive loop but if we know how to ‘see’ rather than to just look we gain a much more interesting view. I think of socio-technical phenomenon as a helix. 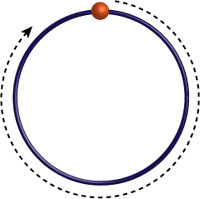 Viewed with an end-on limited perspective everything appears to be travelling repetitively around the same loop, it appears to be a closed circle but if we put more effort into seeing beyond the surface, into new methods of data collection and analysis, we can gain a side view, revealing a helix. This perspective shows us a slow but powerful movement forward. 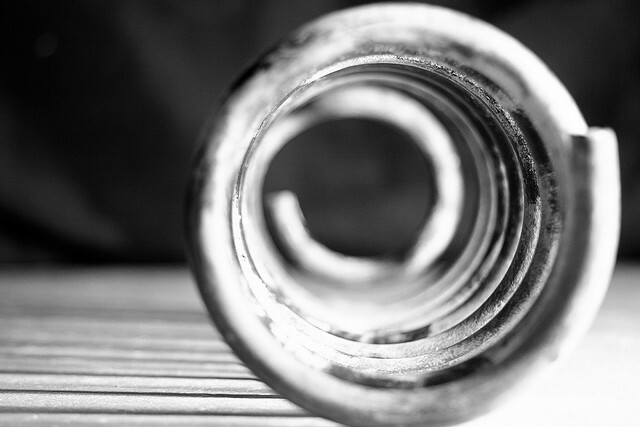 Often though, we are so trapped in the loop of the ever-new present that this progression is only seen in hindsight. Getting past the upgrade-now, 10 tips for teaching with iPads, HD, 3D, faster, better, stronger noise of the loop – sidestepping it if you like and seeing the real morphing/evolution of science and society is, for me, what higher education should be all about. The single biggest factor that can give us the side-on perspective is the ability to critique and to ask pertinent questions. It’s the role of education to equip students with this ability to ask questions rather than to only seek the answers to questions posed by others. Historically the effort required to seek-out answers encouraged students to ask additional questions of their own but now we can find answers online so efficiently we don’t have to engage in critical thinking. Generally these answers are correct and appropriate – this is an issue which is more fundamental than ‘quality’ or ‘validity’, it’s part of a paradigm shift in what in means to ‘know’. I joked that Google’s strap-line should be “Think Less – Find More”. I’m finding that idea less and less amusing, especially after seeing Google Now which is the current apex of not-thinking tech. I’m not against instant access to answers or technology that makes our lives ‘easier’, what I do want though is pedagogy that equips students from an early age with the ability to question the answers thrown back by this kind of tech. The huge cognitive offsetting the web offers us creates a space in which we should be able to ask more and better questions and yet our pedagogy and our assessment is still focused largely on answers until around second year of university (if you are lucky). ‘Bring Your Own Device’ or ‘Smuggle-in Your Own Device’ ensures that students are taking advantage of the cognitive offsetting of the web, it’s time to accept this and take-up the slack. Our Visitors and Residents project is finding that the digital literacies students develop at Secondary/High school are taken through well into university. We haven’t interviewed students younger than 17 years-old but I suspect that the digital literacies (and in some cases the critical literacies) of a 9 year-old are similar to those of a first-year undergraduate. As educators we have to teach critical thinking at a much earlier age otherwise students will be trapped in the highly pervasive info-factory of the web. Yes they will be able to find correct answers but will they be capable of questioning the loop conveniently designed around them (whether well meaning or not) from about the age of 8 by Google, Facebook and the like? This brings me to the knotty problem of serendipity which as been bothering me for some time. It’s not possible to capture it’s essence without it slipping through your fingers. It is in this regard nicely Truth and Beauty in a romantic, dreaming-spires kind of a way and generally a bit of a headache for those outside of the social sciences and humanities. Proponents of the importance of serendipity such as Aleks Krotoski make the crucial point that the individual has to have the ability to be able to recognise the moment it happens (or the moment of potential). In other words they need to be able to bridge two apparently unrelated pieces of information and “…have the creativity to do something new with them” (Here I am talking about the individuals role in taking advantage of putative serendipity rather than technologies possible role in increasing the potential for serendipity to take place) . 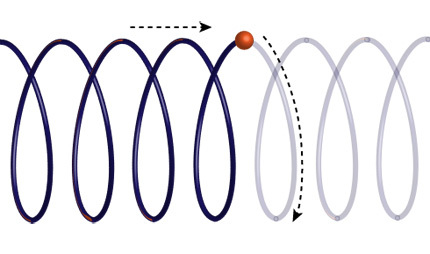 I now think of the moment of serendipity as jumping sections of the helix. It’s a transverse movement across the traditional corrals of understanding. If the helix is imagined as a spiral staircase then those that can ‘see’ serendipitous moments have the ability to jump beyond their floor and leap multiple storeys in a single bound. Not only can they make this leap but they have the perspective to see the distance they have travelled. I would argue that this is unlikely to happen if the individual has been educated to only find answers to questions set by others. In this era of instant answers where technology (or the business model of those providing the technology) is winding the loop around us ever tighter I’m pro equipping our students with the ability to make serendipitous leaps. I’m for stretching the helix so that each turn pushes us further. We need to promote critical pedagogies which put pressure on students to ask questions. Questions that gain perspectives beyond recursive consumption. Instead of falling into “Think Less – Find More” we should be encouraging our students to be suspicious of the loop, to be anxious to make leaps, and hopefully to “Question More – See Further”. For the last two years I have been the Creative Director of the ‘Maths in the City’ project. At the helm was Marcus du Sautoy, that maths guy from the TV and Radio who also happens to be a member of my Continuing Education department here at Oxford and the Charles Simonyi Professor for the Public Understanding of Science. The idea for the project came from discussions Marcus had with secondary schools in London. The overall aim being to ‘engage’ the public with maths by demonstrating how the science of numbers is integral to the urban environments most of us inhabit. The 2 minute video below gives a flavour of what it’s all about. Funded by the EPSRC (who fielded an excellent and experienced mentor for the project) via a public engagement grant the project ran a series of walking tours around Oxford and London which anyone could attend for free. The tours were highly interactive (string, chalk, sweets, springs, sticks, marbles etc.) and designed to interest people of all ages with potentially a very basic understanding of maths. The guides for the tours were all maths students drawn from Marcus’ cabal here at the university called M3. An important aspect of the project was giving these students the opportunity to practice their public speaking skills at the sharp end of maths-communication i.e. in a street with a group of strangers that have random levels of subject understanding. To support and promote the tours we built a nifty website. Nifty because it allows anyone in the world to create a maths ‘site’ and, if they so desire, a tour of their own. The M3 group used the site to help author our main tours of Oxford and London. It also gave us an opportunity to run a competition to increase the visibility of the project and to help populate the website with maths from around the world. over 130 examples of ‘maths in the city’, from around the world, posted on www.mathsinthecity.com, the vast majority from members of the general public. To promote the project and to give it a ‘friendly’ face (we don’t underestimate how daunting contributing to an Oxford University project might be for some) we provided cut-out-and-keep template of our logo/mascot ‘Maths Dave’. Much to our delight people began to submit photos of their very own versions of Maths Dave. People could submit a mathematical site from their city. These ranged from elementary maths such as this site on triangles (one of our competition winners) through to sites such as the ‘Squeaking Labyrinth’ (which is certainly beyond me) and everything in between. The tour ‘sites’ were essentially neat chunks of teaching material (all openly licensed as ‘Open Educational Resources’) which all included great hands-on activities. The project used the tour sites to give ‘stationary’ walking tours or ‘talks’ as they are normally known as part of public lecture series i.e. you don’t have to take the walk to get the maths. One of the most widely appropriated was the Sheldonian Roof site which inspired a whole morning of teaching at one secondary school culminating in this spectacular model. If balancing a ridiculous amount of rulers across desks is not for you then there was always the geeky banter to enjoy over on our Twitter stream and Facebook page or the opportunity to read about the project in one of our many write-ups including the New Scientist. The hub of the project’s activity was of course the physical tours themselves. I went on a few to check everything was running smoothly and remember a six year old and his older brother happily helping to make triangles, rectangles and hexagons with a loop of string in one of the quads of St. Johns college while the adults discussed the shapes which most efficiently tessellate on a two dimensional plane. 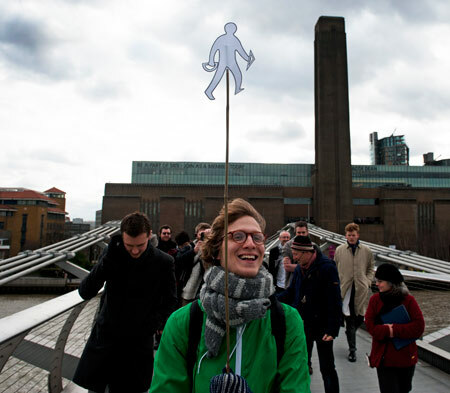 A maths student leads a London tour across Millennium bridge with the aid of Maths Dave on a stick. Engaging the public both online and offline is a delicate business especially when your tour-guide group is made-up of volunteers new to public speaking, trying to complete Oxford degrees and acting as the public face to an institution which has very refined views on ‘reputation’ and ‘credibility’. Instead of writing a dusty report on the project which would end its days in unread pdf purgatory on the outskirts of a funding council website we have chosen to write a series of blog post which discuss our approaches to public engagement on the topics of; teaching/public delivery of complex material, what makes the public participate in public engagement initiatives, community facilitation/the use of social media and the management/encouragement of volunteers. Watch @daveowhite or @mathsinthecity as we release the posts over the next few weeks. I hope they will be insightful for those of you considering public engagement projects.